The rule of law says the law applies to all, no exception. That is, the law applies equally to unequal people. Thus, the law against stealing applies to all, from the richest corporate leader to the President of a country to the poorest person of society. Stealing is a crime, and there is penalty against stealing if one is caught. The law against counter-flowing in roads should apply to all. From the President's car to the most expensive private car in the country to the poor man's transpo. In this case, the trisikad, bicycle with a sidecar for passengers. The number of trisikad in Metro Manila seems to be growing. And they exist not only in areas where there are no alternative public transpo (no jeepney, no buses, no tricycles) but even in busy intersections where other public transpo are present. What is bad or wrong with the trisikad is their penchant to violate all traffic laws. They enter one-way streets (counter-flow), they park on No Parking areas waiting for passengers, they make left turn on No-left-turn streets. There is a feeling among trisikad drivers that "Look, we don't steal, we make money the legitimate way, now you will prohibit us from the streets where we earn a living, or you penalize us with traffic violations when we're already poor?" Now, many trisikad are no longer powered by feet, but by small engines. They are also called "kuliglig". And since they are now motorized, they now carry bigger and wider "sidecars", so they occupy bigger road space now. 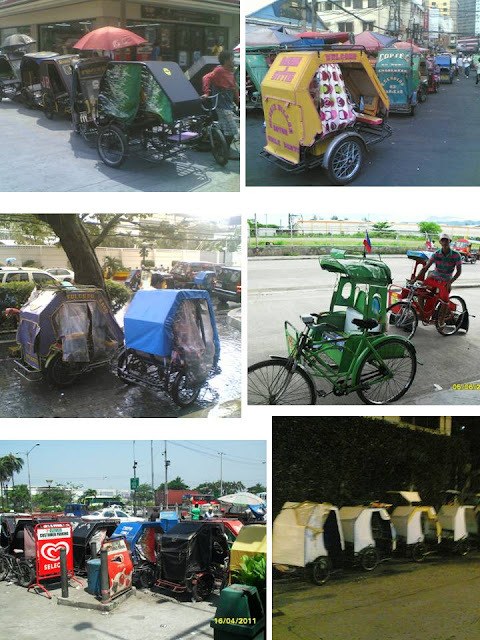 The local governments -- the city, municipality and barangay or village -- have the jurisdiction on small transportations like tricycles and trisikad. If they allow them, so those vehicles will be on the streets. 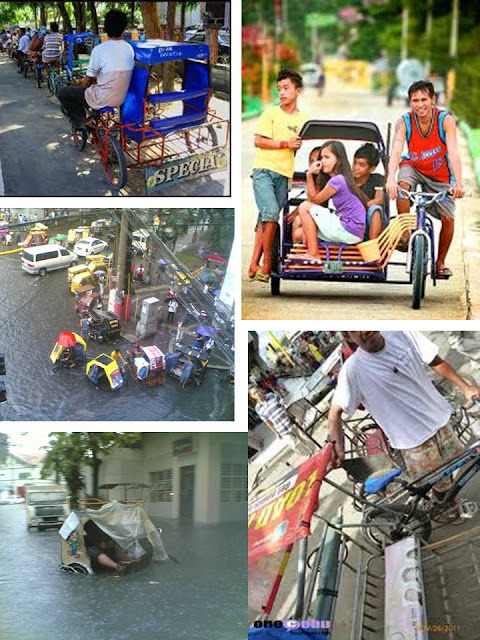 But should the LGUs allow those trisikad, they should be disciplined and penalized if they violate certain traffic laws. They should not counter-flow anytime, anywhere. They should not add more mockery to the already bastardized traffic rules. One positive note about trisikad though: they can carry passengers even in heavily flooded streets as the non-motorized trisikad don't "conk out" when submerged in water. Many trisikad were carrying passengers during heavy flooding like typhoon "Ondoy" flooding in September 2009.